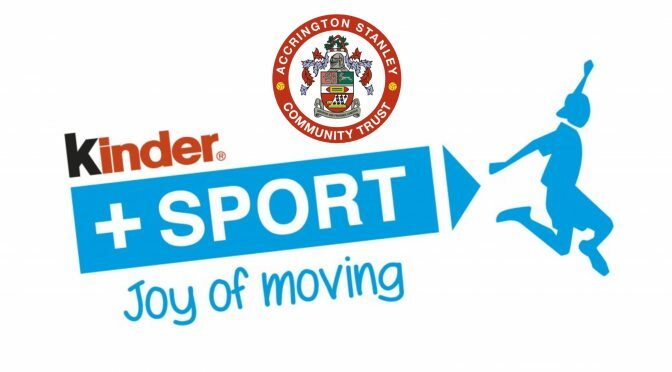 Accrington Stanley Community Trust and Ferrero are now working in partnership to deliver a programme based in schools throughout Lancashire that encourages children to take part in physical activity, build awareness of the importance of a balanced diet and adopt an active lifestyle. We’re playing our local part in a national initiative, rolled out by the Football League Trust’s partner clubs. The programme is aiming to get over 32,000 children moving through the Move & Learn project nationwide, building on the 21,000 reached in schools in its inaugural year. The Kinder +Sport Move and Learn Project is part of Ferrero’s global Kinder+Sport initiative designed to encourage an active lifestyle in children across the world, and has already reached 15m children. Targeted at primary school children aged between nine and ten years old, the programme combines six weeks of practical sporting sessions with classroom based activities. During each 90-minute session, children will learn about the body, diet, nutrition, the importance of exercise and food groups and take part in a practical session of football, handball and dodgeball. A spokesperson from Ferrero said: “We want to have a lasting impact on the activity levels and happiness of young people. Active children are more likely to grow into active adults, so we are passionate about inspiring future generations to embrace physical exercise and find the joy of living.